A hard look at the soft practice of managing and management development. Henry Mintzberg believes that both management and management education are deeply troubled, but that neither can be changed without changing the other. 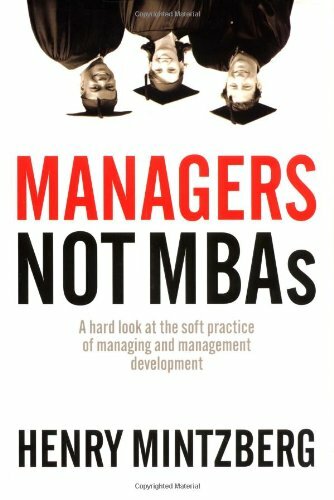 Mintzberg asserts that conventional MBA classrooms overemphasize the science of management while ignoring its art and denigrating its craft, leaving a distorted impression of its practice. We need to get back to a more engaging style of management, to build stronger organizations, not bloated share prices. This calls for another approach to management education, whereby practicing mangers learn from their own experience. We need to build the art and the craft back into management education, and into management itself. Mintzberg examines what is wrong with our current system. Conventional MBA programs are mostly for young people with little or no experience. These are the wrong people. Programs to train them emphasize analysis and technique. These are the wrong ways. They leave graduates with the false impression that they have been trained as managers, which has had a corrupting effect on the practice of management as well as on our organizations and societies. These are the wrong consequences. Mintzberg describes a very different approach to management education, which encourages practicing mangers to learn from their own experience. No one can create a manager in a classroom. But existing managers can significantly improve their practice in a thoughtful classroom that makes use of that experience.